For more information, check out Maine Trail Finder and the City of Westbrook infopage. This urban walkway follows the south bank of the Presumpscot River behind the buildings that make up downtown Westbrook. 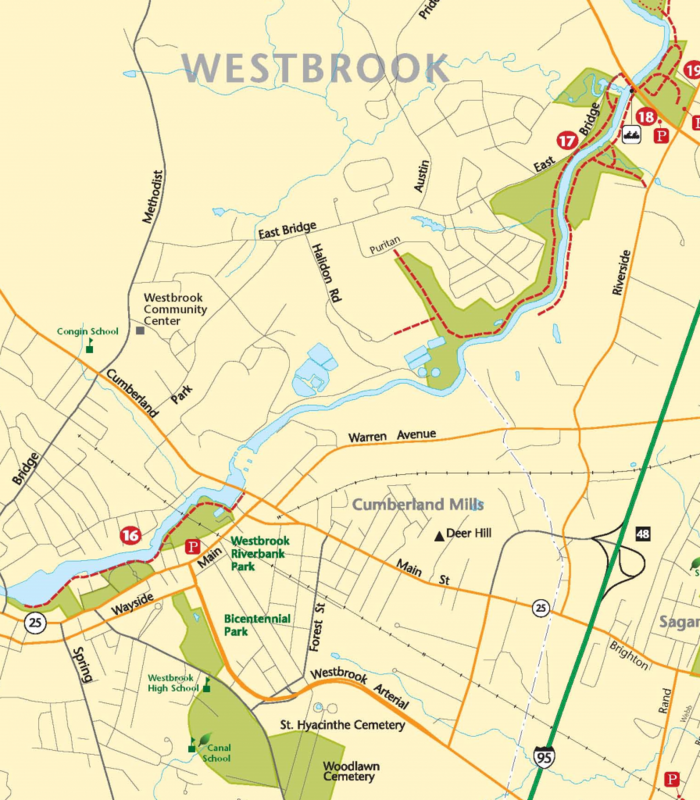 Linking a series of ballfields and parks, the Westbrook River Walk parallels both slack water sections and waterfalls that once formed the nucleus of Westbrook’s early mill history. Saccarappa Falls, just west of Bridge Street, is easily viewed from the numerous benches on the boardwalk that the trail passes over. These falls, like so many others throughout Maine, provided power for the shoe and clothing mills. A number of the old mill buildings still stand on the far bank, as are a variety of ruins associated with those former industries. Another interesting feature of the River Walk is the foot bridge which crosses the Presumpscot River. Attached to the side of an existing railroad bridge, this perch is a great place for bird watching and viewing kayakers.